A luminous round diamond is set into the square face of this 14K bi-color engagement ring. The antique ring features a white gold abstract floral face. 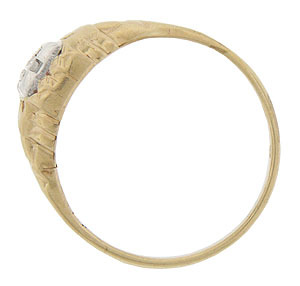 The shoulders and sides of the ring are carved with both cutout triangles and engraved diamond figurals. Abstract engravings continue down the sides of the band. 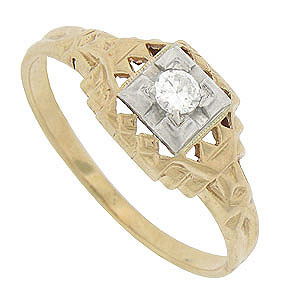 The Art Deco wedding ring measures 7.32 mm in width. Circa: 1930. Size 6 1/2. We can re-size.